This spring, Anne and Jeanne introduced GEMMS to its first academic audience at the Renaissance Society of American meeting in Boston in order to seek feedback from others involved as creators and users of large digital humanities projects. In this post, we would like to share one of the first challenges of our work—developing a taxonomy of sermons and reports of sermons. We hope you will send us your questions and comments, because it’s feedback from potential users – like you – that will be crucial to this next phase of our project. We’d like to find out what kinds of information – and especially what kinds of searches – you’d like this database to provide. The primary objective of GEMMS is to improve access to manuscript sermons archives, many of which are described only minimally in catalogues. 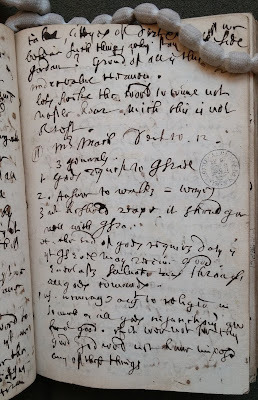 For example, the catalogue entry for British Library MS Add 75511, part of the Althorp papers, indicates that it contains “Sermon notes, medical recipes, and other commonplace material of the Monteage family, 1645-1748.” In fact, the manuscript so described includes fair copies of 20 mid-seventeenth century sermons by prominent puritan preachers, and provides important evidence not only for a number of sermons that are not preserved in print, but also of how they were carefully preserved and possibly circulated; each one is folded and carefully docketed. Since the British Library does not permit photography of this manuscript, the full description in the GEMMS database will be all the more necessary as an aid to further scholarship. The database will improve situations such as this one, first, by offering more detailed information about the contents of each manuscript; second, by enabling the kinds of searches across repositories and across manuscripts that are not currently possible. These include the ability to search for sermons preached by individual preachers, on specific biblical texts, and on specific occasions and/or at specific locations as well as within a specific date range. The Challenges of Diversity: The rich diversity of the materials available for inclusion in the database presents immediate problems of classification. Because we see our database as instrumental in establishing a standardized lexicon or common vocabulary for cataloguing, discussing, and interpreting early modern sermon culture, one of our first and basic structural challenges has been to develop a standard taxonomy acceptable to scholars and users of manuscript sermon materials that recognizes the range of manuscript sermon materials, especially in the growing field that examines sermon notes left by preachers, auditors, and readers. Our early forays into manuscript description quickly brought home to us the complexity of the archive and the challenges it offers, not only to us – primary researchers and project administrators – but also to our research assistants, and ultimately to you as users and contributors. A Preliminary Taxonomy: Our basic division of materials comprises two groups – Sermons and Sermon Reports. We use Sermons to denote a broad category that includes a wide range of records of sermons, including full texts of sermons, sermon notes, and outlines of the main points of sermons. Incomplete sermons also are included in this category as sermon fragments. Each sermon will be entered as a separate record in the database. We added the category of Sermon Reports to our taxonomy to include other types of manuscript records of sermons that only briefly mention sermons, specifically lists of sermons, sermon diaries, commonplace books, and letters. While most sermon reports mention multiple sermons, only one record is entered for each report with a brief summary of the range of sermons recorded rather than a record for each sermon. The terms we use to classify the materials we examine cover a broad and diverse range. Under the category of Sermons, we include complete sermons, ranging from exquisite fair copies, almost all intended for wider circulation (presentation copies [scribal and authorial]), authorially preserved full-length sermons, and manuscripts used by printers, to fair copies with minor deletions and revisions. Sermons with significant numbers of corrections are identified as Sermon drafts. Sermons that are clearly incomplete are identified as Sermon fragments. Sermon notes prepared by preachers include materials in various states of completion. Some are clear, organized, and legible Preachers’ outlines, complete with scriptural citations, headings, and divisions – the type of document a preacher might bring to the pulpit or save for future reference. 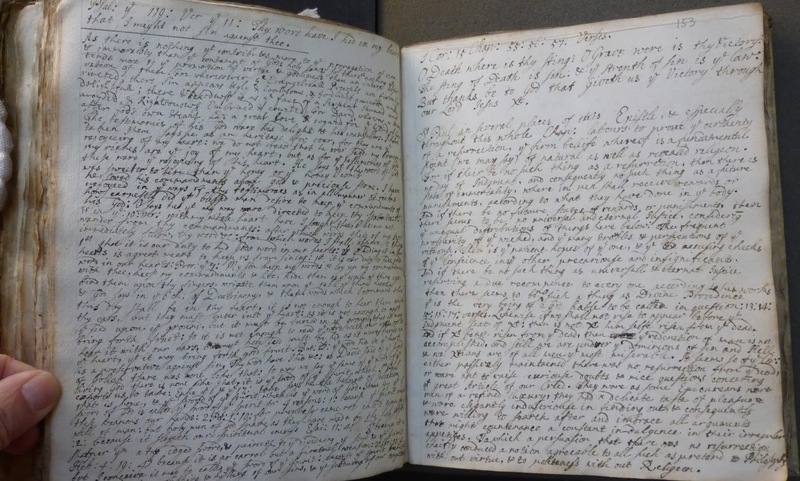 We also include Preachers’ notes, working documents, not intended for circulation, ranging from single paragraphs meditating on scriptural passages to more extensive notes. Aware of their potential to register the impact of a sermon as an oral performance, we include a range of Auditors’ and Readers’ notes. Among the materials we’ve examined, some of these notes are thorough and informative; others are practically illegible, but provide a valuable and immediate point of access to a sermon’s moment of delivery or a reader’s engagement with a printed or manuscript sermon. We try to distinguish between notes made by preachers, auditors, and readers, but when their authorship is unclear, we use the generic term Sermon notes. Transcriptions are sermons that have been copied from another source, whether from print, manuscript, or an unknown source. Such transcriptions can indicate interest in the sermon long after its original occasion and help us to trace its circulation and reception. 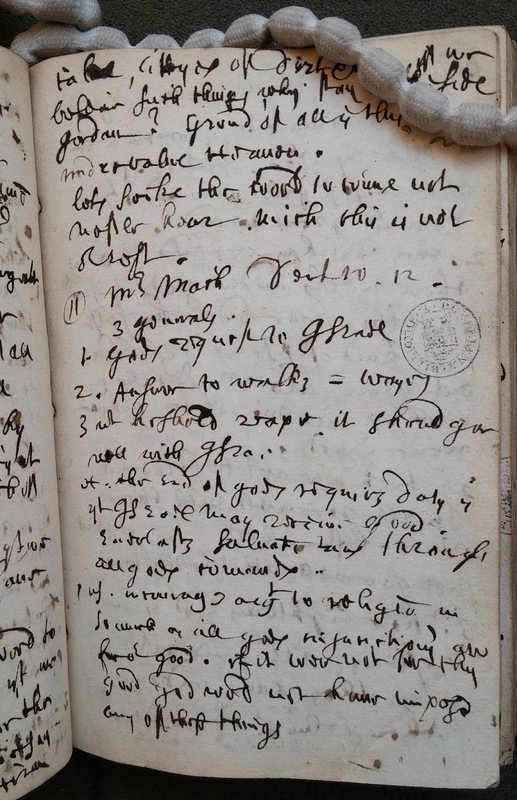 Charles Caesar’s commonplace book (British Library Additional MS 43410) contains sermons transcribed from print with Caesar’s notations on them. The database also includes Sermon Reports; currently we distinguish four kinds of reports: Sermon lists, Sermon diaries, Commonplace books, and Letters. 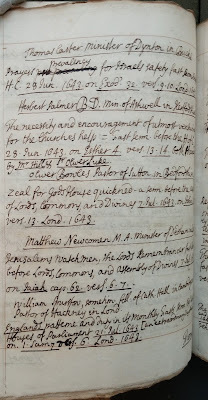 Sermon reports range from simple listings of sermons with minimal preaching information, to diaries and letters mentioning sermons preached or attended, sometimes offering the writer’s evaluation or interpretation of the sermon, or even identifying some of those present. Lists of sermons can help to identify sermons that may have survived in print or in other manuscripts. 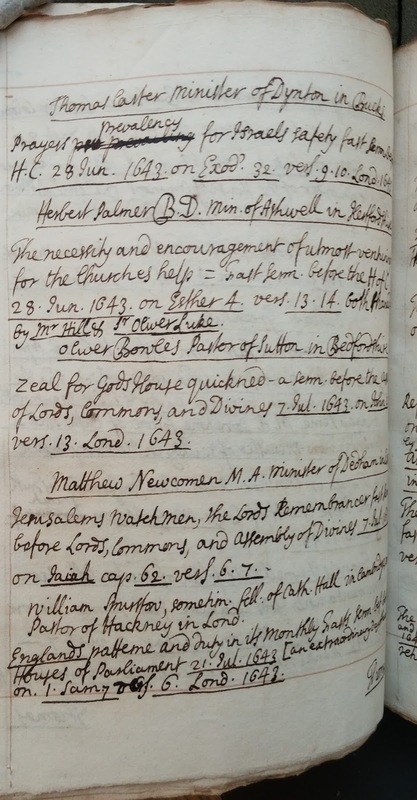 For example, Bodleian Library MS. Rawlinson D. 1076 is a catalogue of parliamentary fast and thanksgiving sermons from the 1640s, including an index of the preachers and a sample of the form used for thanking them for their services. Sermon reports are valuable evidence for the preaching and reception of sermons, but include little or no indication of the sermon’s content. Our goal is to identify these materials at the manuscript level without attempting to itemize all of the contents. In some cases, such as the diary of Thomas Crosfield (Queen’s College, Oxford, MS 390), which contains hundreds of brief reports of sermons, it would be impractical to locate and enter the details of each sermon. 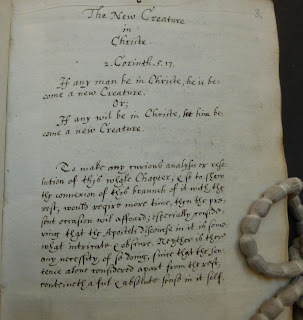 In these cases, the manuscript record will direct users to the item itself, providing any available information such as persons, places, and dates associated with the manuscript in searchable form so that the user can determine whether an examination of the manuscript itself is warranted. We have constructed our taxonomy to make useful distinctions that are at once discernible to those entering data and useful to potential users of that data, without creating an overly complex taxonomy that is intimidating to those groups. Click here for our complete sermon taxonomy. We would appreciate suggestions for improvement, queries, or feedback of any sort on how we are organizing our materials. Feedback from Potential Users: We’re at the point in our project where we would welcome feedback from potential users and contributors. As we refine our design, especially our metadata categories, we need to hear from you, especially with concerns, challenges, and ideas for improving and streamlining our content and our processes. What we really want to know is what you want this database to do for you.